With the Basket activated, users will be able to purchase items from your collection. 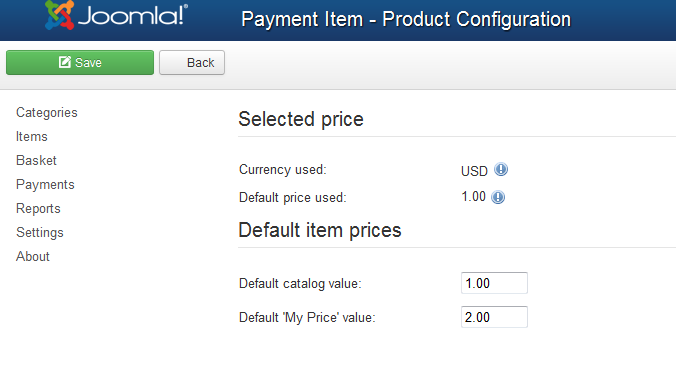 By going to Settings/Payment Items/Product you can define the default values for Catalog value and "My Price" value. One of these can be used on the buying formula which represents the price based on selection of either "catalog value" or "my price value", plus/minus a percent from this selected value, plus/minus a fixed nominated value. Selecting which value will be used from those 2 can be done from the General Settings area. The price of the chosen value will be seen on Default price used along with the Default Currency. From the Payment Gateways page you can see all the available payment methods offered by Collection Factory, giving you the possibility to add new ones to the list and manage the available ones. Clicking on each method a form will be visible, which will need proper configuration before being used. From the listing page you can also select the Default Gateway and enable or disable certain gateways. PayPal - Sandbox mode also available. Other Gateways can be added into the extension. Refer to our API for 3rd party Payment Gateways integration page.